Each year Union Street Gallery hosts a group exhibit featuring recent work by our studio and guild artists. This year the exhibit includes 34 local artists exhibiting a broad range of media and styles, from surreal illustrations to serene landscapes, from sacred installations to whimsical sculpture. Artworks include painting, drawing, pastel, photography, illustration, digital art, mixed media, collage/assemblage, sculpture, and installation. Insider Art is a visually stunning exhibit that will captivate your heart and soul. The work itself is approachable while still challenging our perceptions and evoking emotion. There is something for everyone in this exhibit and it is impossible for the viewer to leave and not have connected with a piece on some level. 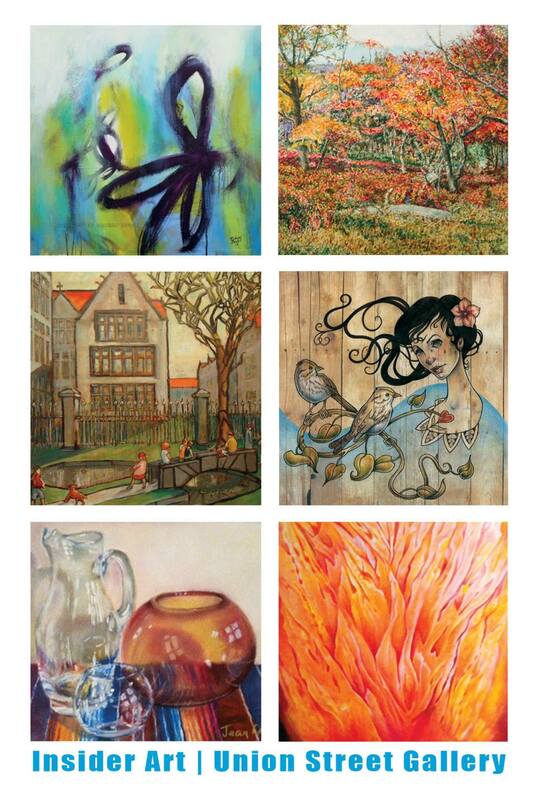 Join us and meet some of these fabulous artists Friday June 21st, 6-9pm. Refreshments and adult beverages will be served. Admission is free but a minimum $5 donation is appreciated. Thank you and see you there! Union Street Gallery is located at 1527 Otto Blvd. Chicago Heights, IL 60411. Richard Benoit, Margaret Brady, Rexanne Coad, Mary Compton, Claudia Craemer, Suzanne Dreher, Pam Eberlin, Barbara Edwards, Irene Ganas, Margi Hafer, Linda Lane Haynes, Madeline Henry, Eve Jensen, Aline Keith, Mark Kennedy, Renee Klyczek Nordstrom, Allison Kortokrax, Jean Lewis, Elaine Martin, Diane McGarel, Joe McIlhany, Harriett Miller, Alexis Moulds, Michele Owens, Roger Paris, Stuart Pearson, Linda Peterson, Ginny Raftery, Pamela Rodey, Leon Sarantos, Richard Schmidt, Jean Schuster, Carolyn Sims, Mary Ann Trzyna. Merci beaucoup de votre intérêt pour notre art.